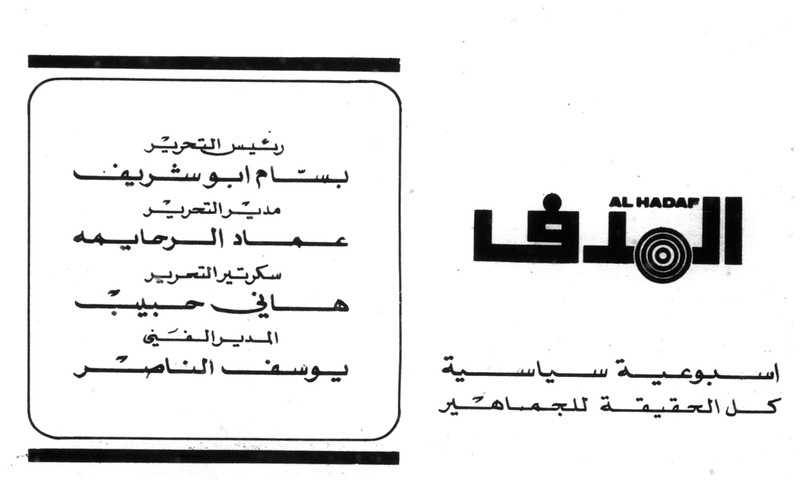 The Middle East Materials Project (MEMP) has microfilmed issues of the Palestinian newspaper al-Hadaf (The Target) from 1979-1989. This Arabic-language weekly newspaper was published by the P.F.L.P. (The Popular Front for the Liberation of Palestine, Jabhah al-Shaʻbīyah li-Taḥrīr Filasṭīn) in Beirut beginning in 1969. Al-Hadaf's founder and first editor was the renowned Palestinian author and intellectual Ghassān Kanafānī (d. 1972), who served as the P.F.L.P. 's spokesman. Al-Hadaf has been and will be of great interest to scholars of the Palestinian national movement, the P.F.L.P., and the Palestinian left. Students of modern Arabic literature who are interested in Ghassān Kanafānī’s work may also find the newspaper useful. This MEMP preservation project was originally proposed by Peter Magierski, Middle East and Islamic Studies Librarian at Columbia University. The holdings were contributed by New York University, the University of Texas at Austin, and Yale University, with assistance from: Guy Burak (Middle Eastern and Islamic Studies Librarian at New York University), Dale J. Correa (Middle Eastern Studies Librarian at the University of Texas at Austin), and Roberta Dougherty (Librarian for Middle East Studies at Yale University).